If you are running OxygenOS on the OnePlus One android smartphone then you need to apply this latest Oxygen 1.0.2 update on your phone. The new update comes with the new Stagefright Security Patch. Stagefright vulnerability is a serious security bug that has put millions of Android devices out there at risk. So its is recommended update for all the oneplus one users, you need to flash this update via recovery. Here in this tutorial we’ll show you how to apply this Oxygen 1.0.2 on your Oneplus one android smartphone. If your phone is running on the Oxygen OS you may just grab the full ROM from the download link below and flash it to your device without performing any wipe (This update does not require a reset). 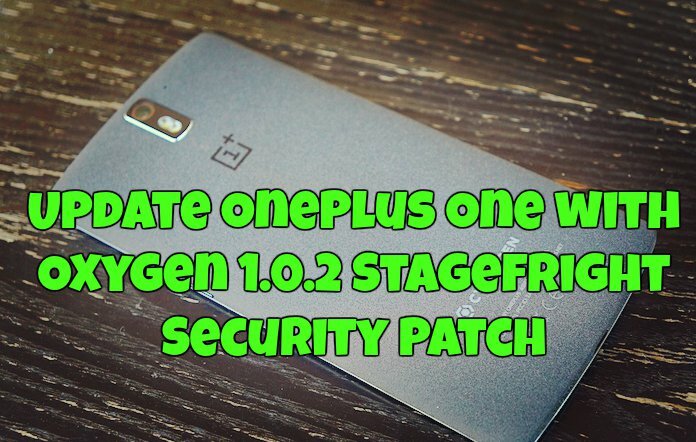 If you are the Cyanogen OS users, then you have to do a complete wipe before installing Oxygen OS 1.0.2 on OnePlus One. So do take the full backup of your phone, and read all the instructions very carefully and follow the steps one by one. Step 1. Download Oxygen OS 1.0.2 zip file from here and place the zip file on your phone internal memory. Step 2. Now switch off your phone and boot into Recovery Mode. We recommend using TWRP. Please use this guide to install TWRP on Oneplus one. Step 3. Once the phone in recovery mode, (Reset your phone by cleaning Wipe cache and data if your are the Cyanogen OS user, no need to perform any wipe if your the Oxygen OS user) go to install and find Oxygen 1.0.2 zip file and Confirm flash. This will flash OxygenOS onto your device. Step 4. Once the zip file is flashed on your phone, go back to the recovery main menu and Reboot the oneplus one. That’s It, Now you oneplus one is updated with the latest fix. Enjoy!